A micromotor, with microchambers shown in the inner cylindrical structure. Credit: Vizsnyiczai et al. Published in Nature Communications. (Phys.org)—When researchers deposit a drop of fluid containing thousands of free-swimming, genetically engineered E. coli onto an array of micromotors, within minutes the micromotors begin rotating. Some of the individual bacteria have swum head-first into one of the 15 microchambers etched on the outer edge of each micromotor, and with their flagella protruding outside the microchambers, together the swimming bacteria cause the micromotors to rotate, somewhat similar to how a flowing river rotates a watermill. The researchers, led by Roberto Di Leonardo, a physics professor at Sapienza Università di Roma and at NANOTEC-CNR, both in Rome, have published a paper on the bacteria-powered micromotors in a recent issue of Nature Communications. "Our design combines a high rotational speed with an enormous reduction in fluctuation when compared to previous attempts based on wild-type bacteria and flat structures," said Di Leonardo. "We can produce large arrays of independently controlled rotors that use light as the ultimate energy source. These devices could serve one day as cheap and disposable actuators in microrobots for collecting and sorting individual cells inside miniaturized biomedical laboratories." A fluid such as the one used here, which contains large amounts of swimming bacteria, is called an "active fluid" due to the mechanical energy it contains. In order for active fluids to be used as a fuel for propelling micromachines, the disordered motion of the bacteria must be controlled so that all (or most) of the bacteria move in the same direction. Video of micromotors rotating in unison. Credit: Vizsnyiczai et al. This is essentially what the micromotors do. The microchambers along the edges of each micromotor are tilted at an angle of 45°, which maximizes the total torque with which the bacteria can cause the motors to rotate. In their design, the researchers also built a radial ramp with strategically placed barriers that direct the swimming bacteria into the microchambers. 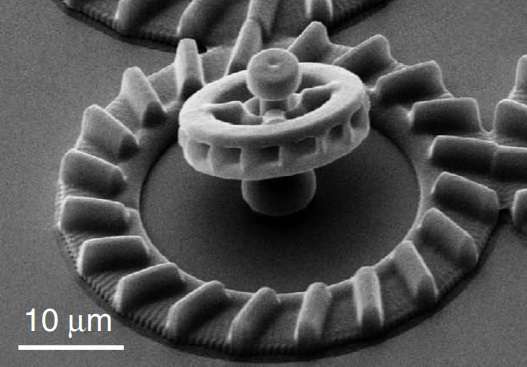 In experiments, the researchers found that a micromotor's rotational speed increases linearly with the number of captured bacteria, and they could easily achieve rotational speeds of 20 revolutions per minute. Another important requirement for any bacteria-powered micromotor is the ability to control the micromotor's motion. To do this, the researchers genetically modified the E. coli strain to express a light-driven proton pump called proteorhodopsin that uses photon energy to pump protons against the electrochemical gradient, which increases the bacteria's swimming speeds. By illuminating the bacteria-powered micromotors with different light intensities, the researchers could then control the speed of the micromotors. In order for these systems to be used in practical applications, it's also important that all of the micromotors in an array have average speeds that are uniform and have little fluctuation. With the help of a feedback algorithm that uniformly illuminates the system every 10 seconds, the researchers demonstrated that the micromotors can effectively be synchronized with very little variation in speed. Using this light-control method, the researchers could rotate a set of micromotors in unison at a particular speed. The bacteria-propelled micromotors have potential medical applications, such as drug and cargo delivery, which the researchers plan to investigate in the future. Flea circuses have come a really long way.